This set of colorful hardwood spheres, cubes and cylinders with laces provides plenty of pre-reading and early math practice. 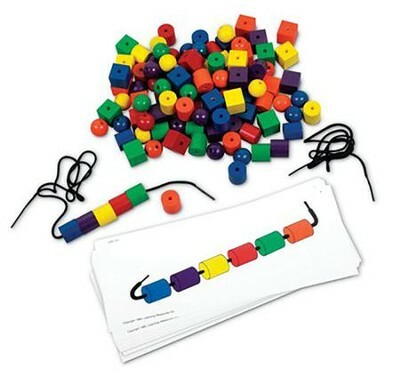 Set includes 20 activity cards, 108 beads in six colors, two 36" black laces with 1" plastic tips and Teaching Notes. Ages 3-7. This set has three shapes: Cylinder, Sphere, and Cube. Each shape comes in 6 colors: Red, Blue, Yellow, Orange, Green, and Purple. The beads each measure about 1" cubed. It also comes with two thick shoelaces and cards for various designs. I'm the author/artist and I want to review Beads and Pattern Card Set.